iOS 7.0.4 has just been released, bringing number of improvements to this year's big iOS 7 software. 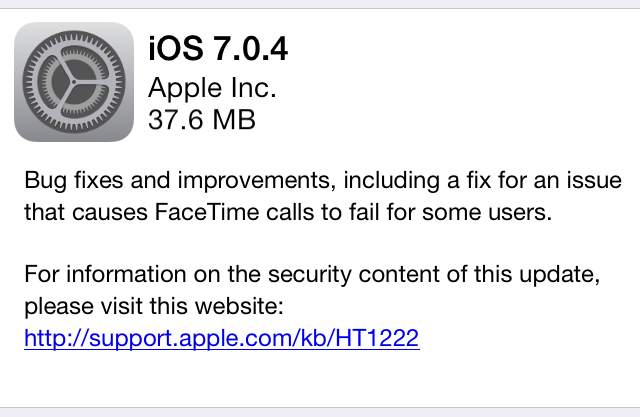 Additionally to some general bug fixes, Apple lists a fix for hanging FaceTime calls as well. As usual, the iOS 7.0.4 can be grabbed over-the-air (OTA) and in-place. This is the fastest and most efficient way to do it, just navigate to Settings > General > Software Update on your iPhone, iPod touch, or iPad. Otherwise, you can tether up to iTunes and do a full backup, install, and restore over USB. Tap on Settings from the Home screen of your iPhone or iPad and select General. Towards the top, you’ll see Software Update and tap on it. Your device will now check for new software and find that iOS 7.0.4 is now available. Once you tap on the Download and Install option towards the bottom, and turn the Wi-Fi on in order to download the update. If the Wi-Fi is off, this option will be greyed out. Depending your internet connection speed, the download process can take some time. Once the process comes to an end, your iPhone or iPad may prompt you to confirm the update, so tap on install and that’s it!